Value Doors are a trusted installer of Rockdoor Composite Doors. As the toughest and most secure Front Door and Back Door option available, Rockdoors increase your home’s security and keep your family safe. Made-to-measure for your doorway’s exact requirements, our Rockdoors are available in 32 styles and 14 different colours. Whether you desire an Irish Oak Rockdoor or White Rockdoor, all of our Rockdoor Composite Door colours revitalise your home external image. If you’re searching for a visually appealing Rockdoor, Ultimate Rockdoors are guaranteed to wonderfully enhance your property’s entryway. For homeowners interested in upgrading their home’s security, you’ll be pleased to know that every inch of a Rockdoor Composite Door is designed with your safety in mind. Rockdoors are 60% stronger than Composite Doors and come complete with an S-Glaze system, ensuring that the glass within your Rockdoor cannot be removed. Their secure multipoint locking system includes nickel-coated solid brass hook locks, German engineered locks and a 3-star, 6-pin cylinder. Offering your home ultimate security, the only way through a Rockdoor is with a key. Our Rockdoor Composite Doors will improve your home’s thermal efficiency, thanks to their reinforced carbon fibre frame and warm edge spacer bars. Allowing you to maintain your home’s warm temperatures all year round, Rockdoors enable you to save money on your heating bills. At Value Doors your Rockdoor price not only includes your new door but also expert measuring, fitting and VAT. Toughened safety glass also comes as standard in the design of our Rockdoors. Your Rockdoor Composite Doors price even contains a 12 Months Key Return Policy and a 10 Year Guarantee. Since you can view all our Rockdoor prices online, you can trust that the price you see is the price you pay. 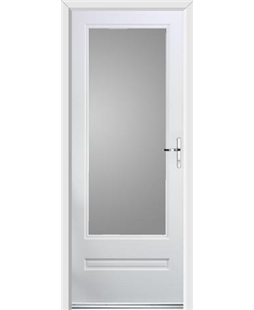 Value Doors also proudly offer Rockdoor French Doors and Rockdoor Stable Doors. With security that is as solid as a rock, door designs that are beautiful and fantastic prices, a Rockdoor Composite Door is the perfect addition for any home. The Virginia range of composite doors from Rockdoor has two large panes of toughened safety glass, either side of a mid-rail perfectly positioned for decorative hardware, such as a letterbox or numerals. Despite the large glass panes, the argon gas filled units help make this door as thermally efficient as possible, achieving a DSER rating of A. 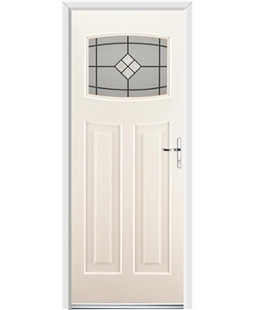 This composite door is available with four different glazing options: Clear, gluechip, diamond lead and square lead. 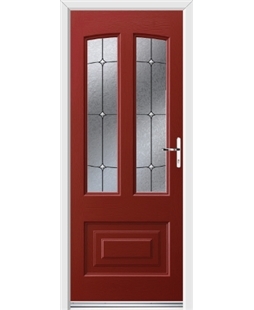 These composite front doors are available in 14 colours, perfect for any home. The Kentucky collection of Composite Doors from Rockdoor has one large glazed aperture in the top half of the door, allowing for striking and intricate glazing patterns to take centre stage. This door can achieve a DSER rating of A thanks to the argon filled double glazed units, the 50mm sash thickness also aids heat retention. 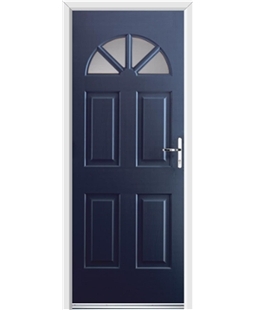 This Composite Door comes in 14 colours, suitable for any home facade. The Jacobean Rockdoor collection of Composite Doors is a modest yet sophisticated design, with the two glazed panes allowing stunning patterns to be framed within a traditional door. 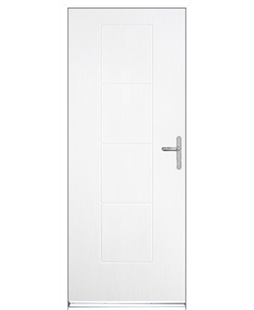 This door can reach a DSER rating of A thanks to its thermal efficiency properties, it is also one of the sturdiest doors available, gaining a level 1 security level as standard. This Composite Door can be fitted with 17 different glazing styles, all toughened safety glass, filled with argon gas for heat retention. 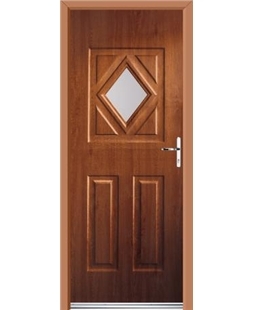 These Composite Doors come in 14 colours, with four realistic timber effects; Irish oak, light oak, rosewood and mahogany. The Tongue and Groove Composite Doors by Rockdoor are a no-nonsense design, backed by no-nonsense state of the art technology. The 50mm door sash aids thermal efficiency and the locking system has been approved by ‘Secured by Design’ the anti-crime Police initiative. This door has impact resistant 3mm skins and the carbon fibre reinforced inner frame ensures this is the strongest door frame on the market. 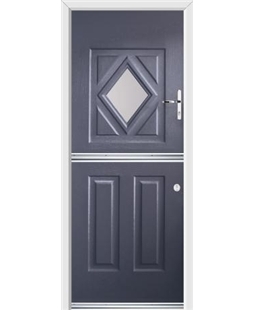 These Composite Doors are available in 14 colours: anthracite grey, blue white, cream, emerald green, onyx, ruby red, sapphire blue, white and more. 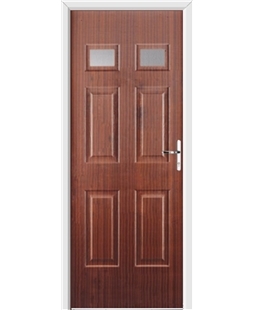 This Composite Door also comes in four realistic timber effects: Irish oak, light oak, mahogany and rosewood. With seven unique mouldings, the Rockdoor Arcacia range of Composite Doors is distinctive and impressive. The centrally positioned single aperture providing a further opportunity to make your door stand out on the street. 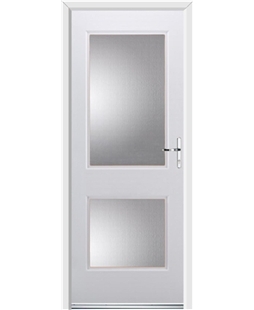 The argon gas filled double glazed unit assists this door reach a DSER rating of A. 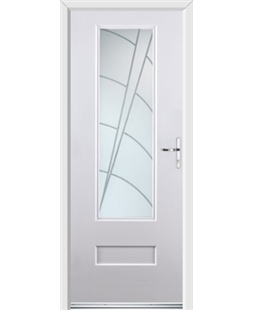 The carbon fibre reinforced inner frame is one of the reasons why this door has a level 1 security rating. 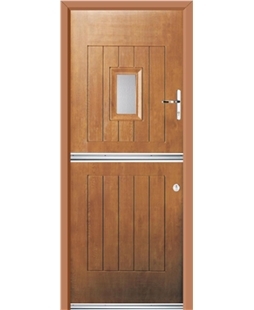 This Rock Door is available in 14 colours, with four timber effect options available. These Rockdoors can be fitted with five different glazing patterns. Please take a look below to find the perfect door for you. 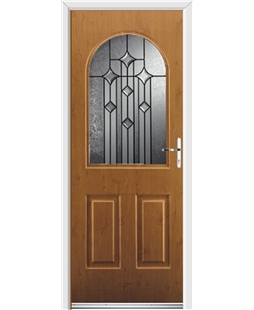 The Rockdoor Georgia Composite Door is a traditional design that allows the centrally themed double glazed unit to take centre stage in your doorway or hallway. This door can be configured to reach a DSER rating of A, the highest in the market. The multi point hook locks and 'Secured by Design' cylinder help make this door one of the impenetrable doors available in the UK. The Rock Door comes with a selection of sic different glazing patterns, please look through the options below to find your ideal choice. 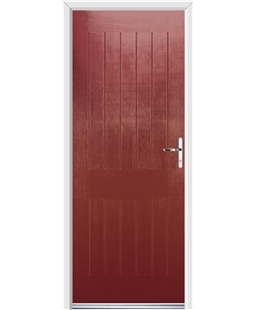 These Rockdoors are available in 14 different colours, eight colours and four timber effects. The Carolina Rockdoor is one of the most popular door configurations in the UK. 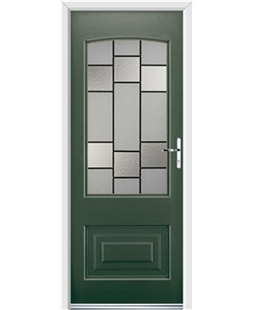 With four small glazed apertures, this door will keep you warm, secure and look stylish while doing it. This door has been rated to have a security rating of 1, the highest in the scale. The toughened safety glass is argon gas filled, helping this door be given an energy rating of A in the DSER scale. This Rock Door is available in ten colours and four timber effects. Please look through the products below to find out more. 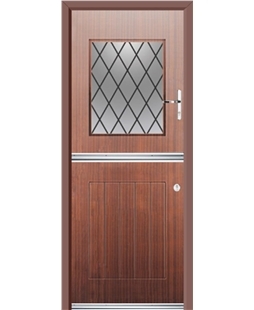 The Colonial Composite Door from Rockdoor harks back to a bygone era, in name and in style. Its 6 moulded, glassless design appealing to traditionalists and the security conscious alike, the Colonial is suitable for both modern and traditional homes. 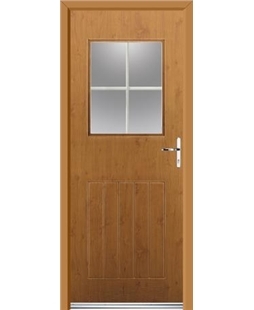 This door is available in eight colours, with four timber effects also available. The tough 3mm wood-grain styled skin is both impact and cut resistant. These Rockdoors also have steel drill plates, meaning thieves are prevented from drilling out the lock. The Regency Front Doors in the Rockdoor Ultimate collection have four mouldings with two glazed apertures towards the top of the door, allowing light to enter your hallway. This traditional appearance looks equally at ease in a modern property or a more traditional facade. Every Composite Door in the Ultimate range can achieve an energy efficiency rating of A, the highest in the DSER scale. They also have been given a security level rating of 1, the best there is. 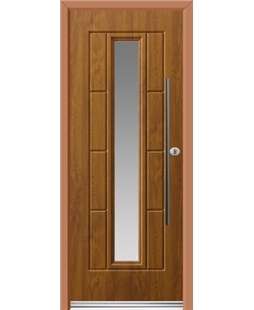 This front door is available in 14 colours, with four timber options. 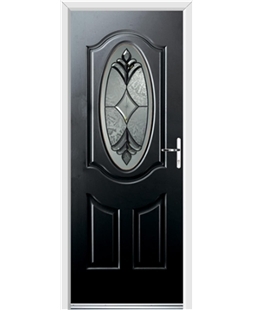 All composite front doors in the Regency collection have a carbon fibre reinforced inner frame; an industry first. If you’re looking for contemporary front doors for your house, the Vogue more than fits the bill. With one large pane of toughened safety glass providing light and a stylish feature for your property, the Vogue will illuminate your home’s facade. This door design, despite the large glazed aperture, is still rated A for energy efficiency and is also considered level 1 for security. These contemporary doors have a variety of glazing designs available, including some 3-Dimensional effect patterns. The Windsor composite design makes for wonderful front doors. The large glazed pane is perfect for allowing natural light into an otherwise gloomy hallway. Because of this feature, the Windsor is just as suitable to be installed as a back door to any home. The Ultimate Windsor Rockdoor provides a level 1 security rating as standard, with ‘Secured by Design’ lock cylinders fitted. This door also has an energy rating of A. These composite front doors have 15 different glazing options available, please review these options below. The English Cottage Front Doors from Rockdoor are just as attractive when fitted as your rear entrance point. The timber effect 3mm skin providing a classy yet understated feel to your new door, with the bijou window distributing natural light through your hallway. The Ultimate English Cottage is rated A for energy efficiency (according to DSER) and achieves a level 1 security rating, utilising German engineered multi point hook locks and cylinder guard protectors. This Front Door can be fitted with a variety of glazed patterns and privacy glass combinations, please click on a product to find out more. The Ultimate Newark range of Composite Doors from Rockdoor borrows style points from the Victorian era and combines them with curved frames for the pane of toughened safety glass. This is a door that eloquently states elegance. As with all doors in the Ultimate section from Rockdoor, the Newark has the best security rating possible (1) and has been given an energy efficiency rating of A; again, the highest available. These Composite Front Doors have a dozen different main glazing options, with even more combinations possible with the variety of privacy backing glass patterns available. This Composite Door design is available with 14 different external colours; please look through the options to find the perfect colour for you and your home. The Stable View range of Composite Doors in the Ultimate collection by Rockdoor allows you to have the benefits of an open door –and all the fresh air you can manage- while ensuring those treasures such as children and pets are kept indoors. 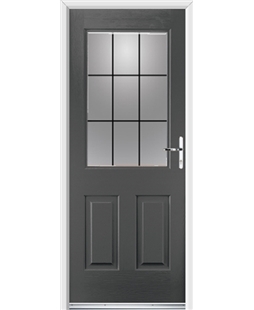 This Composite Door is A-Rated for thermal efficiency, partially due to the 50mm door sash and double weather seal. The toughened safety glass units in this Composite Stable Door are filled with argon gas, again helping keep the warmth in your home. The Ultimate Stable Spy Composite Door collection by Rockdoor gives you the chance to bring the fresh air into the rear of your home while keeping pets and animals inside. Perfect for homes where the back door is in the kitchen, the Stable Spy will add value to any property. 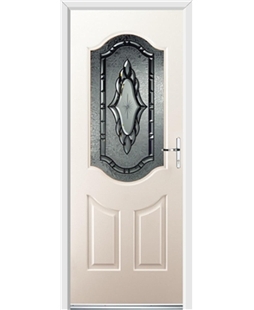 This Composite Stable Door is available with four different gazing options, with two different lead designs. These Composite Doors come in a dozen different colours, some a realistic timber effect. The Portland design of Composite Doors is ideal for those caught between the Kentucky range and Windsor, as it’s a mixture between the two. Its large glazed pane will allow plenty of light to cascade into your home and according to Rockdoor itself; the Portland Composite Door with Beacon glazing has become a firm favourite across the country. These Composite Front Doors look just at home as a rear door for your home. 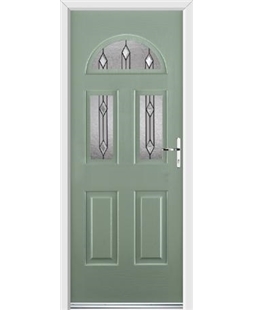 This Composite Door is available in 14 colours and with over 7 different glazing patterns and a variety of backing glass to choose from; the options available to create your own signature door are huge. Any door from the Montana range of Ultimate Composite Doors by Rockdoor will make for a beautiful traditional looking door, with the large glazed pane perfect for the variety of glazing designs available. This Composite Door is available in 14 different colours and comes with half a dozen different glazing patterns to choose from. These Composite Front Doors are a rated as standard for thermal efficiency and are the most secure Composite Door on the market. The Cottage Spy Composite Doors from Rockdoor are suitable for any property, despite their name. 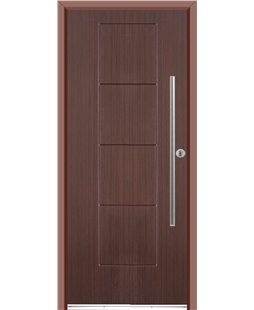 Traditional yet minimalist in appearance, they would look wonderful as a door for your home’s secondary entrance. These Composite Front Doors are available in 12 colours, along with four different glazing patterns for the bijou window. This Composite Door has a 50mm thick door sash and multi point hook locks to help protect against unwelcome visitors. The Cottage View selection of Composite Doors is similar in style to the Cottage Spy, but with a larger pane of glass in the top half of the door, this is a great choice if you’d like more natural light to enter your property. The Cottage View Composite Door has an argon gas filled pane of glass, helping retain heat in your home, keeping energy bills manageable. 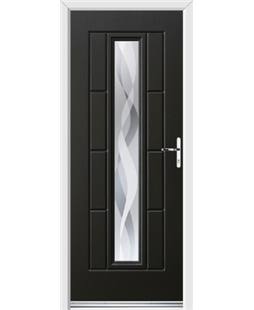 These Composite Front Doors are available with five different glazing patterns and come in 12 different colours. The Vault Composite Front Door is a no-nonsense design, the large argon gas filled pane of glass allowing light into your home while keeping the heat inside too. This door makes either a wonderful front or back door. 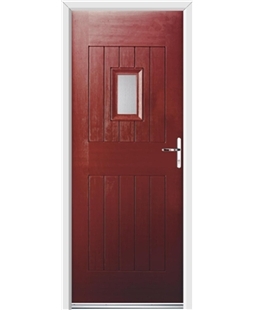 This Composite Door is available in a 12 different colours; four timber and eight coloured. These Rock Doors have a 50mm thick door sash and carbon fibre reinforced inner-frame, ensuring undesirables are kept at arm’s length. 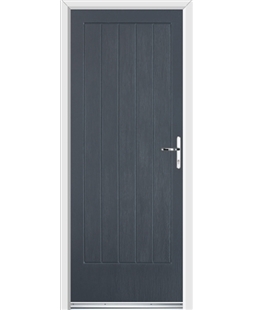 Rockdoor’s Classic Composite Door is modern on the inside, traditional on the outside. The design belies what technology is at work underneath the 3mm door skin. Despite almost being 75% glass, this door still has a thermal efficiency rating of A, the best available. These Rock Doors come in a dozen different colours; ten colours and four timber effects. These Composite Front Doors have a security rating of 1 out of 7, the best you will find on the market. One of the newer Composite Doors Rockdoor have created, the Tennessee is a modern twist on a classic template. The three glazed apertures are a perfect opportunity to make your front door stand out from the street. 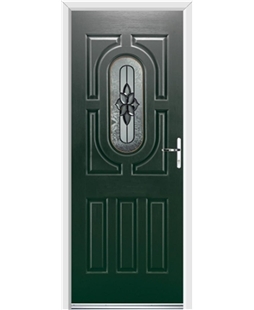 These Composite Front Doors are available with ten different glazing patterns and fourteen different colours. These Rock Doors can also be fitted with three different thresholds, please speak with your local installer or contact our enquiries team to find out more. The Ultimate Stable Diamond Composite Door collection is our most striking stable door offering. With the diamond shaped glazed aperture and eye catching mouldings, this is a door that will attract the attention of your neighbours and friends. This Composite Stable Door has an A rating for thermal efficiency, meaning it is the most heat retentive stable door on the market. Ultimate Diamond Composite Doors will appeal to those who appreciate the aesthetics of the Stable Diamond door, but do not require the split open feature the stable door has. 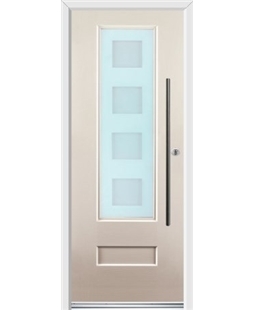 The unique moulding configuration is eye catching and along with the diamond aperture, this door looks sturdy and appealing. 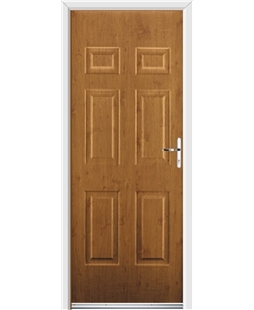 This Rock Door is available in fourteen colours, all with a realistic wood effect finish. These Composite Front Doors are fitted with industry leading security measures, including a ‘Secured by Design’ cylinder. 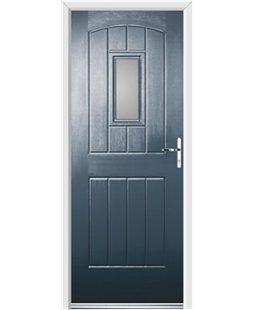 Rockdoor’s Vermont Composite Door is modern on the inside, traditional on the outside. The design belies what technology is at work underneath the 3mm door skin. Despite almost being 75% glass, this door still has a thermal efficiency rating of A, the best available. Rockdoor’s Vermont with Bar Handle Composite Door is modern on the inside, traditional on the outside. The design belies what technology is at work underneath the 3mm door skin. Despite almost being 75% glass, this door still has a thermal efficiency rating of A, the best available. Rockdoor’s Illinois Composite Door is modern on the inside, traditional on the outside. The design belies what technology is at work underneath the 3mm door skin. Despite almost being 75% glass, this door still has a thermal efficiency rating of A, the best available. 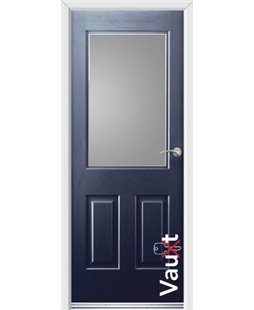 Rockdoor’s Vogue with Bar Handle Composite Door is modern on the inside, traditional on the outside. The design belies what technology is at work underneath the 3mm door skin. Despite almost being 75% glass, this door still has a thermal efficiency rating of A, the best available. The Dakota Composite Doors by Rockdoor are a no-nonsense design, backed by no-nonsense state of the art technology. The 50mm door sash aids thermal efficiency and the locking system has been approved by ‘Secured by Design’ the anti-crime Police initiative. 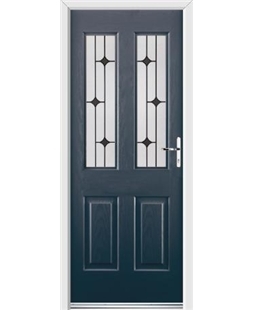 These Composite Doors are available in 8 colours: anthracite grey, blue white, cream, emerald green, onyx, ruby red, sapphire blue and white. The Indiana Composite Doors by Rockdoor are a no-nonsense design, backed by no-nonsense state of the art technology. The 50mm door sash aids thermal efficiency and the locking system has been approved by ‘Secured by Design’ the anti-crime Police initiative. The Indiana Composite Doors by Rockdoor are a no-nonsense design, backed by no-nonsense state of the art technology. The 50mm door sash aids thermal efficiency and the locking system has been approved by ‘Securedby Design’ the anti-crime Police initiative.